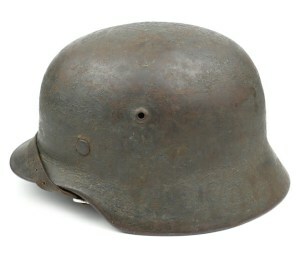 Wehrmacht Helmet Chinstrap (Stahlhelm Sturmriemen). The early chinstrap is nicely maker marked and dated 1937. Complete with aluminum buckle and studs. Perfect for completing your M35 helmet. 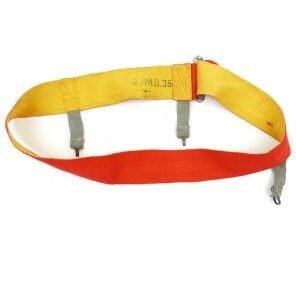 Rare and hard to find original early pre-war chinstrap! 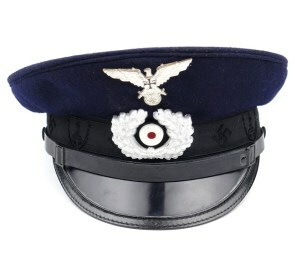 Luftwaffe EM/NCO's overseas cap (Schiffchen für Unteroffiziere und Mannschaften). The cap is showing stunning markings, being double maker marked by the company of 'Willy Sprengpfeil, Mützenfabrik' from Hamburg and dated 1939, LBA marked as well. Stunning original cap! 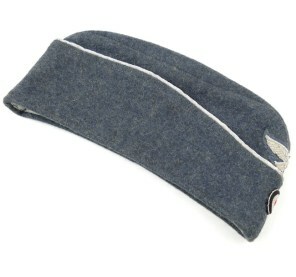 Luftwaffe 'Fliegertruppe' (Flight) EM/NCO's Visor Cap (Schirmmütze), complete with aluminum insignia. The visor cap is nicely maker marked by the 'Lieferant Albert Kempf' from Ronsdorf and dated 1939, the cap is size 59 marked. Nice original Visor Cap! Wehrmacht Helmet Chinstrap (Stahlhelm Sturmriemen). The chinstrap is nicely maker marked by the company of 'Rahm & Kampmann' in Wuppertal, I can't read the date. Nice original example in good condition, hard to find replacement item! 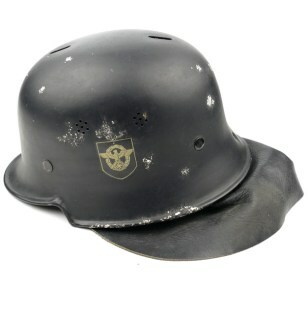 WH (Heer) M17 Single Decal Combat Helmet (Stahlhelm M17). 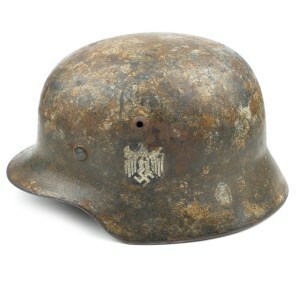 The steel construction Austrian type M17 helmet retains most of its original field-grey/green paint, a standard Heeres decal is visible beneath the paint. Complete with early type liner. Nice helmet in used condition! 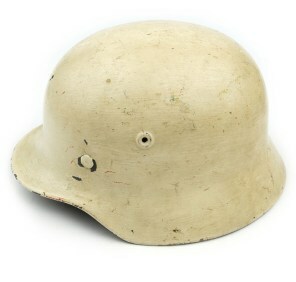 German M34 Civil Defence/Luftschutz Helmet (Stahlhelm M34). 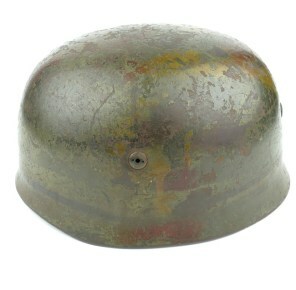 The stamped sheet steel construction M34 helmet retains most of its original early fieldgrey coloured paint. The helmet is complete with it's original civil style leather liner and chinstrap. Nice original helmet in good used condition! Double Decal M34 Fire Protection Police Helmet (Feuerschutzpolizei Stahlhelm M34). Both the police and party decal are for about 95% present, the helmet is showing normal traces of usage and some small scratches. Nice original helmet in good condition! 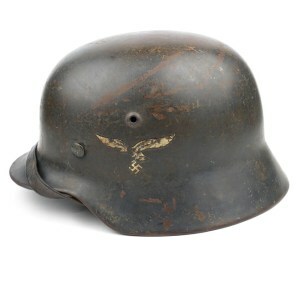 Luftwaffe 'LKpN101' Summer Flight Helmet (Netzkopfhaube mit FT-Gerät). The cap is complete with label and maker marked with manufacturer's code 'hdc' which is indicating production by 'Luftfahrtgerätewerk Hakenfelde GmbH' from Berlin-Spandau. 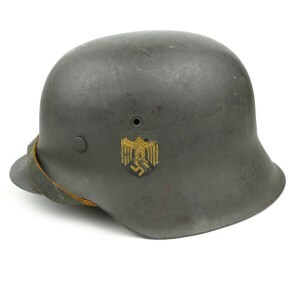 Nice original 'Netzkopfhaube' in good condition! Wehrmacht Helmet Chinstrap (Stahlhelm Sturmriemen). The chinstrap is nicely maker marked with RB.Nr.'0/0750/0100'. Nice original example in good condition, hard to find replacement item! 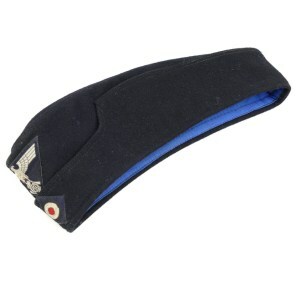 2nd model 'DRKB, Kyffhäuserbund' Officer's Visor Cap (Schirmmütze für Veteranen). Complete with its original cap-eagle and cocarde. Beneath the sweatband is a nice label marked with 'D.R.K.B."Kyffhäuser"-Mütze'. Nice original cap in good condition! Bulgarian Armoured Troops Field Cap worn only by the soldiers and officers from the Armored Brigade and the motorised infantry. 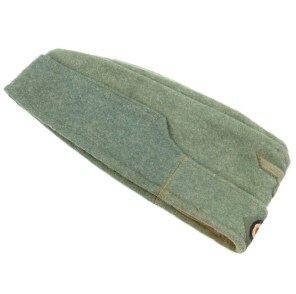 Brown wool construction cap similar to the German M43 cap. The cap is in overall good used condition! WH (Heer) reversible camouflage winter hood. 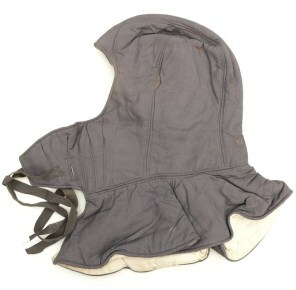 The Sumpftarn/white reversible hood is not visible maker marked or dated. It is in used condition, showing clear traces of usage. Nice original example! 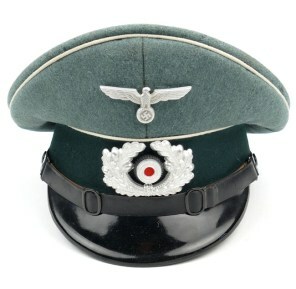 WH (Heer) 'Infanterie' EM/NCO's Visor Cap (Schirmmütze). The cap is complete with it's original early aluminum cap-eagle and cocarde. The size '54' cap is marked with 'Deutsche Facharbeit'. The cap is having a great shape. Nice original visor cap in very good condition! 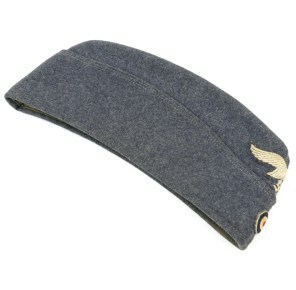 Luftwaffe Officer's overseas cap (Schiffchen für Offiziere). The overseas cap is complete with it's original applied hand-embroidered cap-eagle and cocarde. 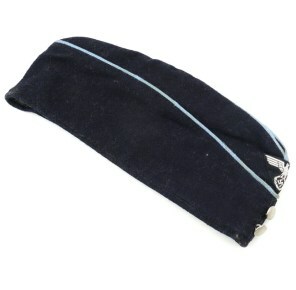 Hard to find original officer's overseas cap in very good condition! 'Deutsche Arbeitsfront' Werkschar Personnel's Overseas Cap (Mütze für Werkscharen der DAF). Complete with original flat-wire cap-eagle. These DAF overseas cap aren't easy to find, nice original example in very good condition! Czech M34 Helmet which has been re-issued to the Luftschutz, repainted in Luftschutz blue-grey and complete with decal. The helmet is complete with the the 5 liner pads and an original period chinstrap. A rare and hard to find helmet in used condition! 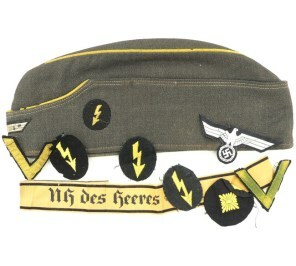 'Technische Nothife' (TeNo) Personnel's Overseas Cap (TeNo-Lagermütze). Both insignia are nicely machine sewn to the cap. The cap is nicely marked with a TeNo logo and size '58' marked. These original TeNo overseas cap aren't easy to find, nice original example! 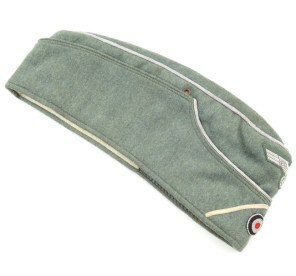 WH (Heer) 'Infanterie' EM/NCO's Visor Cap (Schirmmütze). The cap is complete with it's original early aluminum cap-eagle and cocarde. The cap is nicely named and unit marked with '3./J.R.64.' (Infanterie-Regiment 64). The cap is having a great shape. Nice original visor cap! Wehrmacht Helmet Chinstrap (Stahlhelm Sturmriemen). The chinstrap is nicely maker marked and dated with 'ftb 43' indicating production in 1943. Nice original example in good condition, hard to find replacement item! 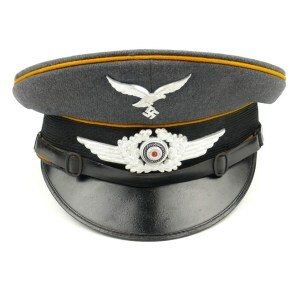 Dutch made Wehrmacht overseas cap (Feldmütze). This is a reissued Dutch EM's overseas cap, altered for use as a Wehrmacht EM's overseas cap Complete with originally hand applied BeVo cap-eagle and cocarde. Nice original overseas cap in good used condition! WH (Heer) Infantry Officer's M38 Overseas Cap (Einheitsfeldmütze M38 für Offiziere). The cap is complete with an officer's type flat-wire woven cap-eagle, hand-embroidered cocarde and a white coloured soustache. Great looking original cap! Luftwaffe M43 Cap (Einheitsfeldmütze M43). Complete with machine-sewn cap-eagle and hand-applied cocarde. The cap is having grey-coloured rayon lining material, it is nicely marked with a RB.Nr. Nice original cap in good used condition! German Police 'Schutzpolizei' Shako (Tschako für Mannschaften). Complete with shako-eagle and cocarde. The shako is nicely maker marked by the famous 'Erel' company from 'Robert Lubstein from Berlin. 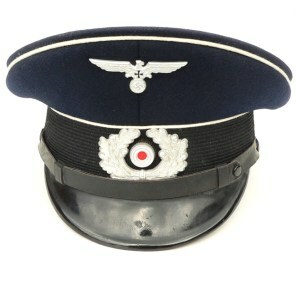 Overall a nice original Schutzpolizei Shako! 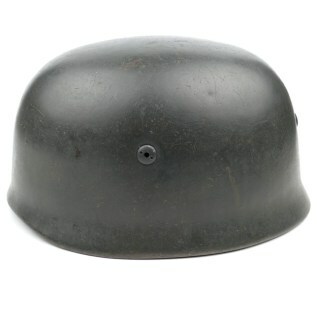 Wehrmacht reissued Dutch M34 Combat Helmet (Stahlhelm Holländisch). Complete with it's original slightly damaged standard M31 Wehrmacht liner, size '57', dated 1943. Only a few of these helmets are known. Very rare original piece in used condition! 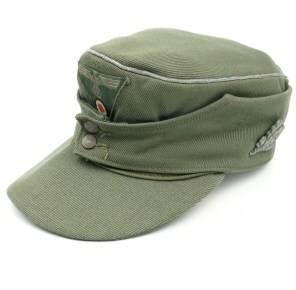 Dutch made Wehrmacht overseas cap (Feldmütze). This is a reissued Dutch EM's overseas cap, altered for use as a Wehrmacht EM's overseas cap Complete with originally hand applied BeVo cap-eagle and cocarde. Nice original overseas cap in very good condition! 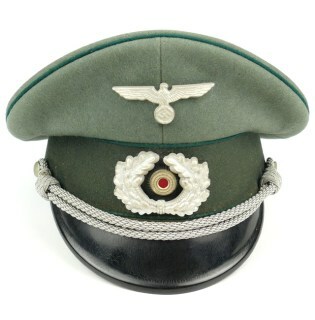 WH (Heer) Administrative Official's Visor Cap (Schirmmütze für einen Wehrmachtsbeamten). The 'Erel' marked visor cap is complete with it's original early aluminum cap-eagle and cocarde. Nice original visor cap in good used condition!